We’re through Week 4 in the NFL, which means we have a quaint naming convention for an All-Pro team! You guys already know the drill, so without further ado, here’s your first-quarter All-Pro squad. 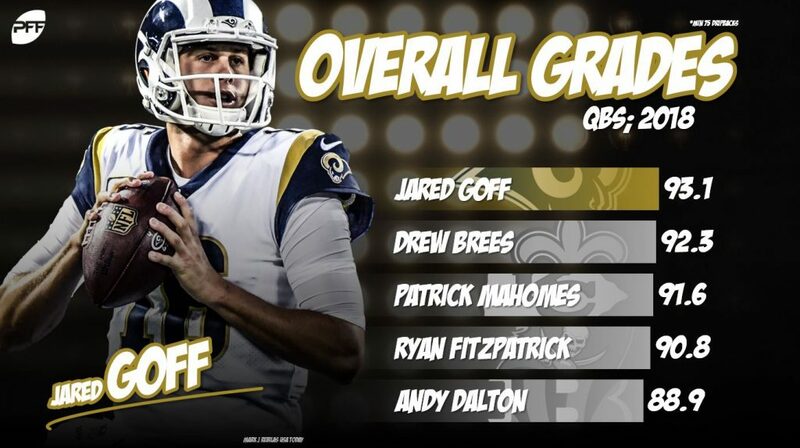 Goff narrowly edges out Mahomes and Drew Brees on the backs of one of the highest-graded performances we’ve ever seen. He’s been lights out throwing down the field, but he actually hasn’t been asked to do so that often. The Rams’ signal-caller is 8-13 on passes traveling 20-plus yards for a ridiculous 322 yards and five touchdowns. What Alvin Kamara is on pace for as a receiver is absurd at this point. 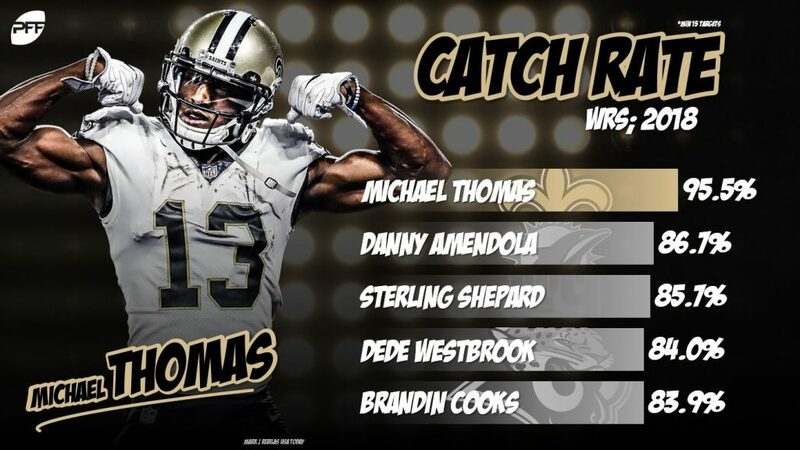 If he matched his output for the next 12 games, he’d finish with 140 catches and 1,344 receiving yards. It also doesn’t hurt that he’s picking up 2.8 of his 4.9 yards per carry after contact and leads the league in rushing touchdowns. In a league chocked full of productive deep threats so far this season, Jackson stands on top. He’s hauled in six of his seven targets that have come 20-plus yards downfield for 274 yards and three touchdowns. His 4.20 yards per route is .74 clear of second place Julio Jones at the moment, and he’s done it all without dropping a single pass. It’s reaching a little bit to call Thomas a slot, but he’s still taken over a quarter of his snaps there this season so far. His stats at the moment are like something out of a video game. Of Thomas’ 44 targets, he hauled in 42 of them for 445 yards and three touchdowns. The crazy thing is, of those two misses, one was a drop. The 2017 tight end class was hyped as one of the best ever, and after a somewhat disappointing rookie campaign, they’ve delivered in Year 2. Kittle gets the slight nod because of volume, but at the moment, Howard leads all tight ends with 2.88 yards per route while Kittle is second at 2.87. The 36-year-old’s performance hasn’t slipped an inch since coming over to LA last offseason. He’s allowed all of one hit and two hurries so far for the highest pass-blocking efficiency of any tackle in the league. The left side of the Rams’ offensive line has been murderous so far and Saffold’s hot start is a big reason why. Like Whitworth, Saffold has only allowed one hit and two hurries so far this season while also being tied for the league lead in big-time run blocks. Kelce’s reign atop the center position continues. He was the highest-graded offensive lineman in the entire NFL a season ago and hasn’t had any sort of Super Bowl hangover to speak of. No surprise here, as Martin has consistently been either atop this list or honorable mention over the course of his career. The Dallas guard hasn’t allowed a sack since Week 10 of last season and continues to be the gold standard for pass protection on the interior. Moton gets the slight nod here due to his impressive work in the run game, though Schwartz deserves recognition as the highest-graded pass-blocking right tackle in the NFL so far this season. Moton, though, has been no slouch himself, allowing only three hurries all season and taking only five downgrades in the run game all season. 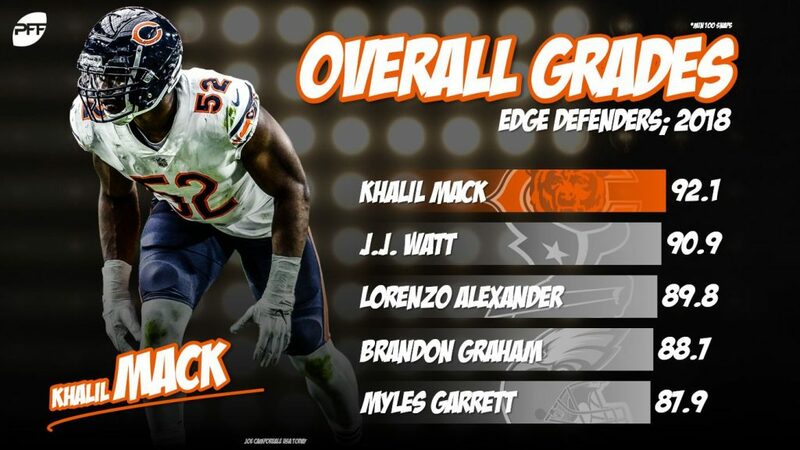 You’d have to have not watched a single minute of football this season to not know Mack would be making this list. He’s not simply pressuring quarterbacks; he’s making game-changing plays. He’s forced a fumble in every game so far and added a pick-six for good measure. It might not be peak J.J. Watt, but he’s still punking guards and tackles alike. Like Mack, Watt has also forced four fumbles so far and notched five sacks. His 90.9 overall grade isn’t quite the utter dominance we’ve seen in the past, but the season is still young. You might get sick of hearing about Donald’s dominance from us, but we obviously don’t get sick of talking about it. He’s simply on a level all by himself right now as a pass-rusher. His 30.4 percent win rate is the highest of any player, regardless of position. The fact that he’s doing it on the interior makes it that much more impressive. 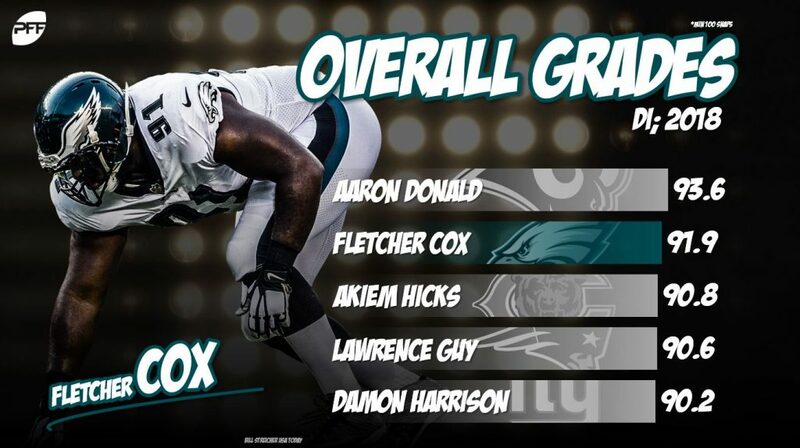 Cox is off to the best start of his career, which is saying something given how good he’s been. We collect times a pass-rusher beats an opposing offensive lineman yet the pass is thrown too quickly to record a pressure. Cox’s 11 such blocks defeated are the third-most of any defensive lineman in the NFL. Wagner’s tackling prowess is reaching unfathomable proportions at this point. He hasn’t missed a single tackle this season and has only missed three of his last 171 tackle attempts. Wagner has also forced more incompletions than any other linebacker so far this season (four). Martinez is asked to wear a lot of hats in the Packers DB-heavy scheme and so far he’s delivered. He’s made nine stops in coverage this year, the second-most of any linebacker in the league and has broken up three of his 14 targets. After switching from safety to corner over the offseason, it’s not hyperbole to say that Jones has been the best cornerback in the NFL so far this year. He’s been targeted 16 times, allowing only seven catches for 51 yards. That’s fewer than 13 yards allowed per game! It’s been quite the start for the Cowboys defensive back. Peterson has been deadly as a matchup man corner, but now he’s replicating that prowess playing far more zone coverage than ever before. He’s allowed seven catches on 14 targets, with only two of those catches resulting in a first down and five resulting in coverage stops. After establishing himself as one of the best slot corners in the NFL last season, Callahan is doing his best to prove he’s the best this year. Of his 14 targets on the season, only five have resulted in first downs, while he’s made coverage stops on five others, picked off one and broken up two. He’s so far been the third-most infrequently targeted slot corner in the NFL. With Thomas’ season over at this point, he’ll have to settle for the first quarter All-Pro instead of his customary season-long version. He has easily been the highest-graded safety in the league, as he’s allowed as many catches as he has interceptions (3). Jackson is one interception behind Thomas (although he had one on a nullified play) and has been a sure tackler so far with only one miss on the season. Derwin James deserves some recognition as honorable mention here, though, as he’s the only rookie to make this roster. James has three sacks, two hits and five hurries on 22 pass-rushes so far. The lone blemish on Tucker’s scorecard so far this season is a blocked field goal in the game against the Denver Broncos. You can’t blame him for that miss, and he’s been perfect outside of that. He leads the league with three field goals of 50 or more yards, putting him on pace to beat his previous best of 10, which he delivered in 2016. Palardy has been excellent at pinning opposing returners inside their 20-yard line, and ranks inside the top ten in net yards, with his punts allowing just 25 return yards so far this season. Roberts just edges out Tyreek Hill for this spot right now, but you wouldn’t be upset having either returning punts for you. So far this year Roberts leads the league with 160 punt return yards, including a 78-yard return for a touchdown. Jones has seen 71 snaps across the kick return, kick coverage, punt return, and punt coverage units. So far this season he has registered five tackles on special teams, tied for third in the league, and blocked a punt against the Baltimore Ravens in Week 3.